My client was having a “shabby chic” themed 1st birthday for her daughter. 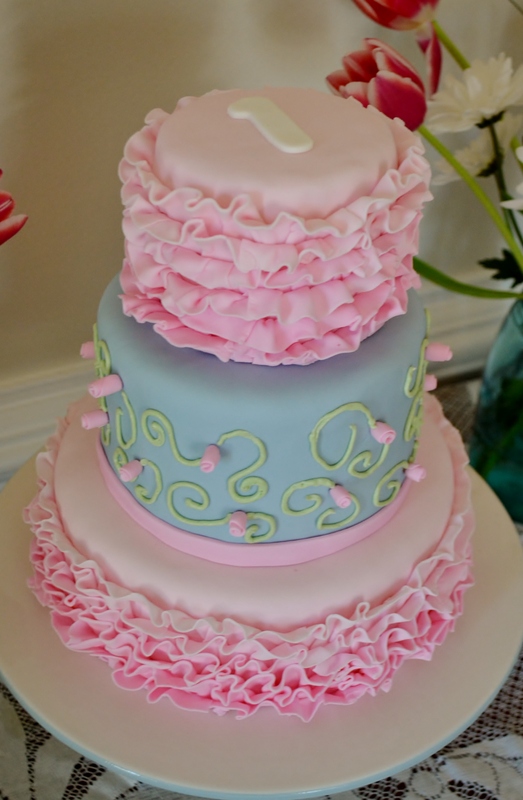 The only request that she had for the cake was that it have ruffles! I felt that doing an entire cake in ruffles might be a bit overwhelming, so I sent her a few other designs and from those we decided to add the flowers with the scroll stems to the middle cake. I know that the “smash” cake is popular for 1st birthdays. Of course, I would be happy to make a separate smash cake, but another option is to make the 8/6/4-in cake and use the top as the “smash” cake.